What is the archetypal small Italian town? 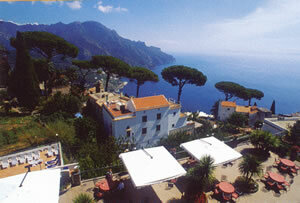 Ravello, I think. Perched on top of the cliffs which have made the Amalfi Coast the backdrop of a hundred romantic films, Ravello seems almost too good for this naughty world. A thousand feet above the Mediterranean, its privileged position affords views which are so outrageously beautiful that they are positively medicinal. They return to the mind’s eye whenever a helping of serenity and beauty is needed to raise the spirits. And the place itself is like an opera-set: a perfectly assembled confection of piazza, cathedral and narrow streets. Indeed, the decay on the buildings has progressed so prettily that, at first sight, one suspects that it is the work of some talented exponent of trompe-l’œil. 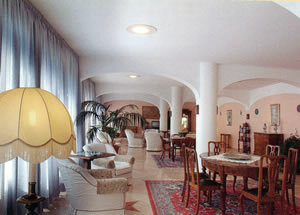 Here, as is only right, there are some wonderful hotels of high quality. 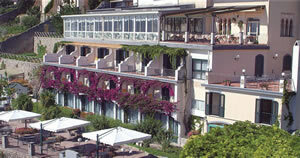 And the one with the best location is the Hotel Rufolo. Let me at once declare an interest. I always admire those hoteliers who take my advice. It shows that they are determined to drive their establishments towards perfection. 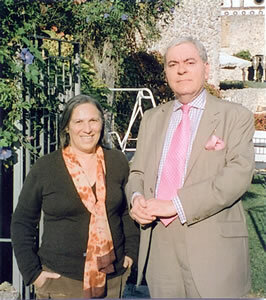 The last time I stayed at the Rufolo, I mentioned to the owner, Miss Rosaria Schiavo – pictured, with your correspondent – that the rooms lacked wastepaper bins and that the only hand towels in the bathrooms were hard, rather than soft. Both deficiencies have now been supplied. (And a new spa and a grand new swimming pool have also been added.) That this charming lady is so efficient should come as no surprise, for she is descended from a long line of hoteliers. Indeed, the Schiavo family opened the Rufolo over a century ago. D.H.Lawrence began Lady Chatterley’s Lover here, and here Douglas Hurd snatched a few quiet days away from his duties as Home Secretary. I have no doubt that both these fine fellows appreciated the position of the hotel. It is but a few steps from the Piazza Duomo, and is right next to the historic Villa Rufolo, with its famous gardens (open to the public). 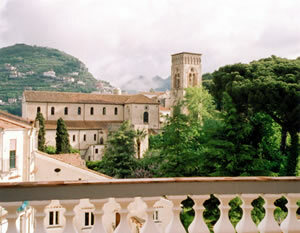 It also enjoys a panorama which includes the coast and far-off Salerno. You will, of course, want to book one of the spacious junior suites, from which you can gaze at this spectacular sea view (400-550 euros a night, bed and breakfast for two, according to season). I was in one such apartment on the second floor – room number 211. Its light colours – white for the walls and blue/green for the floor tiles – increased the impression of abundant space, an impression confirmed by my pacing out of the bedroom (12 feet by 10 feet) and the sitting room (16 feet by 10 feet). The two were joined by an archway. The sitting room easily accommodated a sofa, two easy chairs and a writing table. A door opened into a walk-in wardrobe (with a safe) and a sliding French window led onto my balcony, with its magnificent vantage point over the sea and the coastline. In the tiled bathroom I found a decent tub with a jacuzzi facility, one wash basin, a loo, a bidet and a separate shower. The towels and bathrobes were by Frette. Breakfast is always important. Regular readers will know that I am a committed fan of the day’s first meal, and my experience at the Rufolo confirmed my enthusiasm. The hotel has a long terrace, and there, under a large shade, with pots of geraniums framing the picture of sea and sky and pine trees and with the early sun beginning to disperse the mist on the ocean far below, I have frequently broken my fast with leisurely contentment. But on this visit the weather was less kind, so I was confined to the ground floor breakfast room. Still, this was no penance, as there was the charming Daniela to bring me pots of coffee and glasses of freshly squeezed orange juice, and the food from the buffet – bacon and scrambled eggs, croissants, jam tarts, Corn Flakes, bread rolls and homemade marmalade – was all good. 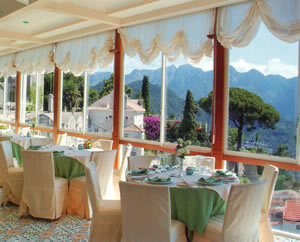 Dining at the Rufolo is done in the Ristorante Sigilgaida (pictured), on the second floor. 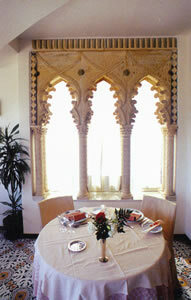 Again, the spectacular view – this time through plate glass windows – offers its magical charm. But there are other delights, too. The tables are large and round, the automatic piano (the most sensible alternative I have ever encountered to ‘live’ music) rattles through some of Mr Mozart’s clever melodies and good Riedel glassware stands on tablecloths of white damask. The waiters – like Franco and Gennaro – are smart in their white jackets. They lift the silver domes with a flourish and are eager to attend to their guests’ requirements. And the whole enterprise is controlled with charming expertise by the maitre d’ (in black tie), Salvatore Somma. It would be difficult not to enjoy eating in this environment. Prices for the 100 offerings on the mostly Italian wine list are friendly. They begin at 16€ for an Asti spumante and end at 230€ for the 2009 Sassicaia. Veuve Clicquot champagne is 95€. Other bottles I noted were: 2008 Tignanello (90€), 2004 Gaja Barbaresco (140€) and 2004 Mille e una note, Donnafugata (55€). 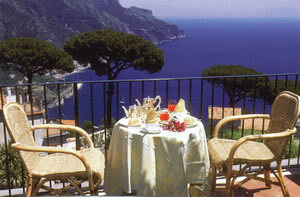 Ravello is, indeed, the archetypal small Italian town, and the Rufolo is the archetypal small Italian hotel – friendly, comfortable and perfectly located. You will enjoy them both. 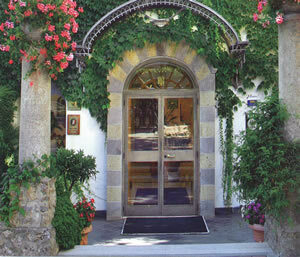 Via San Francesco 1, Ravello 84010, Italy.